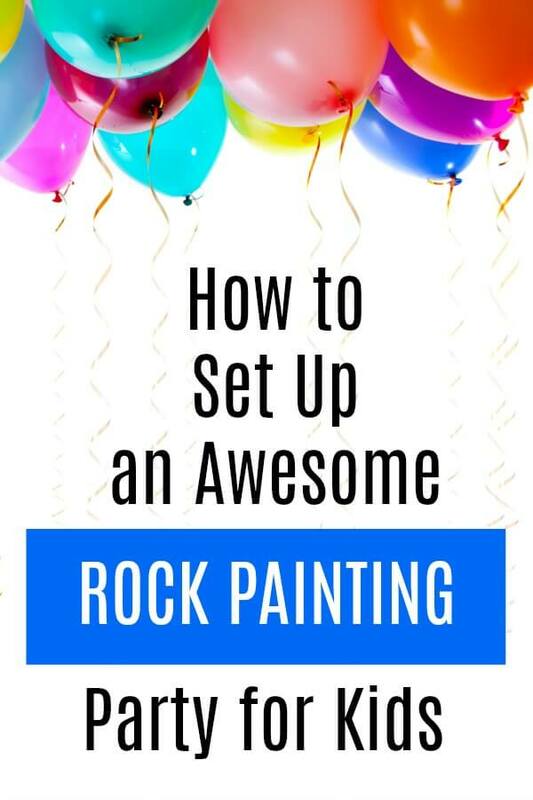 Let’s set up the best rock painting party for kids! 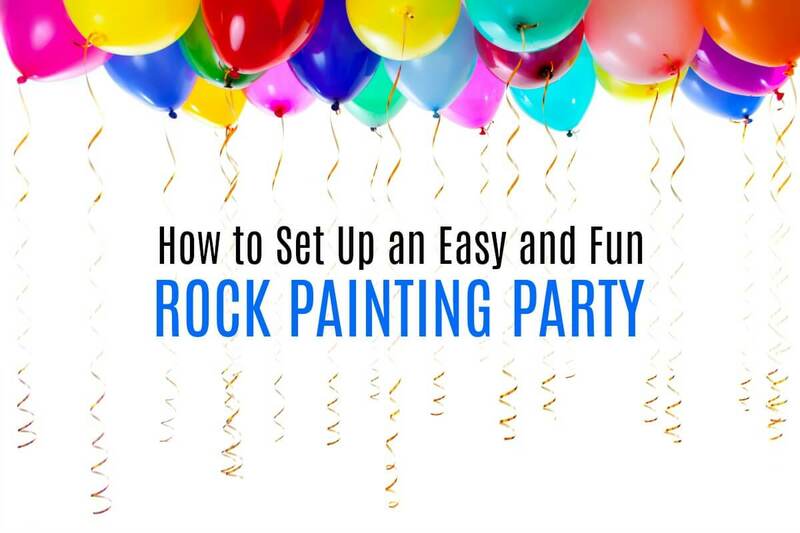 From party decor to party games, your rock painting party will be the talk of rock painters everywhere! Oh my gosh, aren’t you excited? I know so many of us love the painted rocks hobby sweeping the world. My daughter loves painting, hiding, and finding rocks. Her classmates have even started bringing their painted rocks to school for trading. Using pebbles (1-1.5 inch rocks), create a game board and simple designs for a Painted Rock Tic-Tac-Toe. These would make amazing rock painting party favors, by the way. Using an inexpensive bag like these (we used them for a playdate), this would be the best party favor for painted rock fans. You’d need quite a few rocks for this set, but I love the idea to create a domino game from painted rocks. 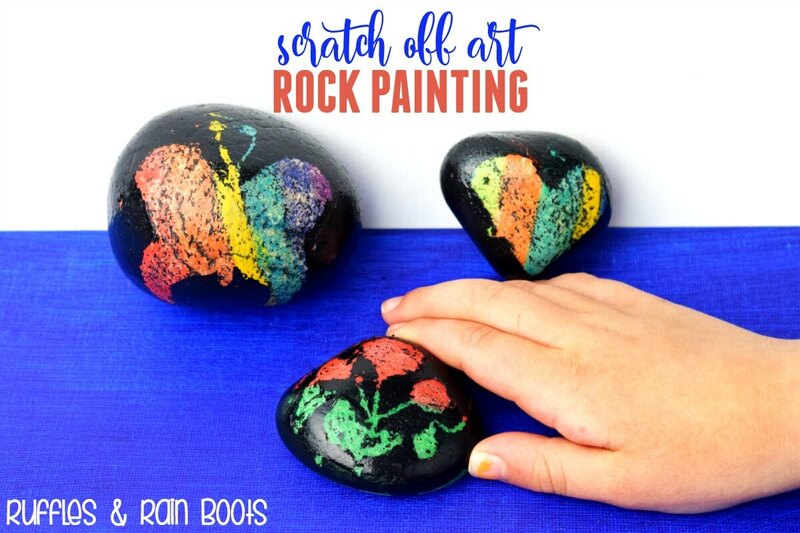 I wouldn’t set this up as a rock painting party activity with young kids, but it could be fun to have the whole group play together. 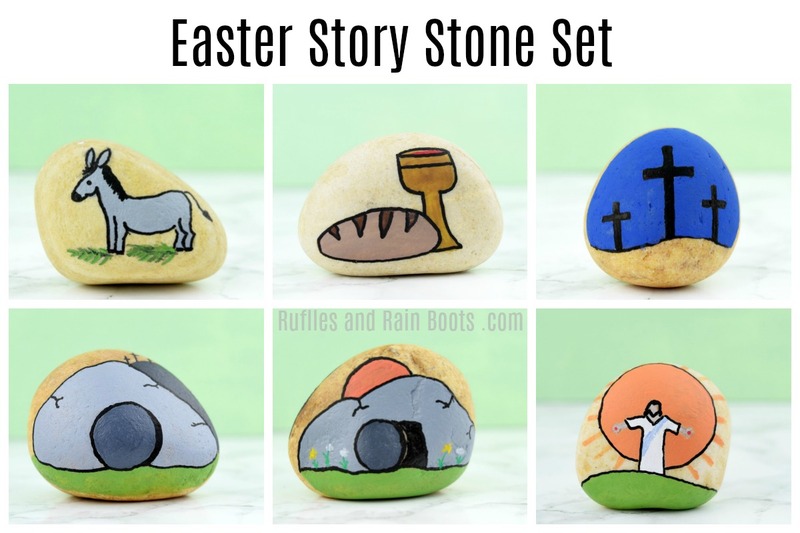 Kids LOVE story stones – I cannot tell her how many times we’ve listened to my daughter tell the story of Easter using these Easter story stones. It’s likely bordering on a 1,000 times now that we’ve heard it and we still love it because she gets so excited about it. You might just want to set out these palettes filled with paint and let them make whatever they’d like. To make it easier on young children, you can provide images or temporary tattoos to attach to their painted rocks. We show you how in this rock painting with clipart tutorial. Rock painting parties are so much fun and honestly, I’m not sure the kids are going to hate any of these ideas. I’m a big fan of making things easy, so I picked up the bags I mentioned (for favor bags) and the kids got to take home the bag, the artist palette, and their painted rocks. We also let them choose from a few tiny art-related trinkets we got from this adorable eraser set. Our rock painting party was a playdate not a birthday, so we kept it light. We had a colorful tray of veggies which the kids actually ate because it was shaped like a rainbow. Next to that, I set up a series of kid-friendly snacks (goldfish, grapes, etc.). 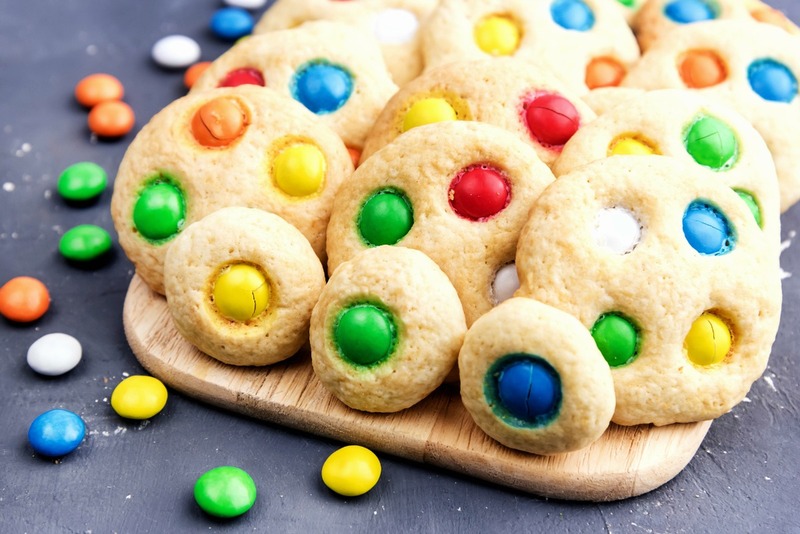 For our sweet treat, we had simple candy cookies. They were very colorful and bright which helped fit the painting party theme. One thing I didn’t have which I now think would have been a good idea is painting aprons for the kids. We ended up using towels and various scrap fabric, but it would have been nice to just have the aprons. If the party is for kids, stick with rocks no smaller than 2 inches. I say this because any smaller and younger kids have a really hard time trying to paint designs on them (unless they use our favorite rock painting pens). We have purchased rocks from everywhere – online, at our local landscaping supply yard, and even at big box home improvement stores. If you’re setting up a large party, the most cost-effective is the landscaping supply store. The metallic rock painting pens we have are nothing short of amazing. My daughter loves them so much that all of her last 10 rocks have been made with them! Brushes are available everywhere but online might be your best price. You want a mix of foam brushes (for basecoats) and detail brushes. If this is getting to be too much, you could always set up a few of these scratch art rocks ahead of time and let the kids create that way. These round plastic artist palettes are what we used. After our rock painting party I saw these flower palettes – they’re so stinking cute, aren’t they? We had so many of these inexpensive palettes and they became part of the party favors for the kids because they all loved them. Now to the paint. I’m going to be frank here and say, for a rock painting party for kids, buy the cheapest acrylic paint for kids. We buy this brand and I use it to base coat rocks. It’s thick and covers well. Another benefit is that it can be slightly watered down for the kids to make it easier to use. For decorations, we use these acrylic paints (there are so many colors and they’re very inexpensive). ModPodge (there’s an outdoor version) is good to protect rocks, but polyurethane is better. You can get a spray or a wipe on, but it’s not something I’d let young kids do on their own. Tip: if you’re using the paint pens, add a coat of ModPodge prior to sealing with polyurethane. 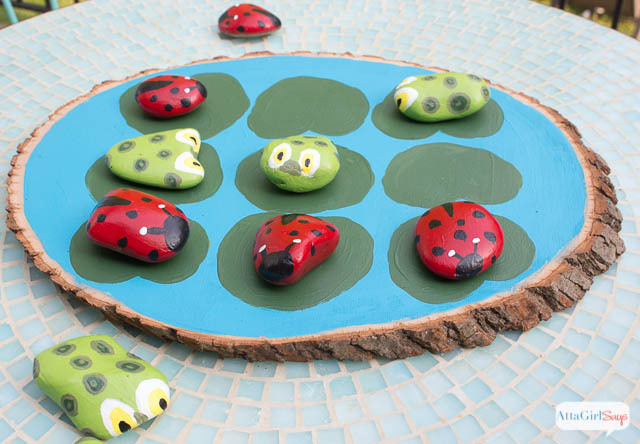 What will you set up for your rock painting party for kids? Because I know we’ll do it again, one thing I would add is painting aprons sized for kids. Would you please share this on Facebook or save it to your favorite rock painting board on Pinterest? Your shares are how we grow and we are sincerely grateful.